It may be a loooooong night! Katie has a lovey that she sleeps with and she has had it since she came home from China. It is a small ladybug taggy blanket. 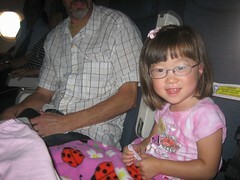 (pictured here with Katie on our way to China 3 months ago). I purchased it from Tina at The Story of You for her and one for her friend Mia who we were waiting for at the time as well. Well, both Katie and Mia cannot sleep without their blankets. This is just a fact of life in our house. Recently, we have been able to convince her to sleep with a larger blanket in addition to the lovey as it no longer covers her completely. Let me tell you, convincing her to do this was quite a feat. The blanket has traveled everywhere that we have and even was brought half way around the world and back when we adopted Ethan. We even go so far as to make notes and stick them on the door before a trip so as not to forget it. Listen, if you find a way to ensure that your child will sleep you will go to any length, well maybe almost any length, to make sure that nothing interferes with that. Actually Mia's mom, Shannon and I have tried to find a spare one just in case but have been unsuccessful. Well, we have finally reached a fork in the road so to speak. This morning Marc decided to take the kiddos to Grandma and Grandpa's house on his way to work becuase I am sick (once again the kid crud got me) and could rest. He is such a doll. They were up there the whole day so of course he not only brought the blanket but also her pillow for her nap. I am sure you can see where this story is headed. He came home and within a few minutes his mom called to give him the bad news...that he FORGOT THE BLANKET and PILLOW...ARGH!!! He actually hit his forhead with his hand in self disgust..LOL. My in-laws live up in the next county so he cannot go back until tomorrow to get the blanket and pillow. We are trying to be optomistic and look at this as an opportunity to wean her off of the blanket. P.S. Marc just walked in and informed me that the babydoll that she sleeps with (we sent that to her in China in her care package and her foster family brought it to us on Katie Starr day) is also up there...double arg!!!! You know the old saying (it was actually lyrics to an old song)...You say Potato and I say Potahto; you say tomato and I say tomahto, so on and so forth. Well, in our house one little person (who shall be referred to hereafter as Thing One) pronounces that much beloved furry red monstor by his given name; Elmo and the other little person (who shall hereafter be referred to as Thing Two) pronounces his name Elma. I am sure you can guess by the amount of time that thing one and thing two have watched Elmo who is mispronouncing the name. Well today, Thing One wanted to watch Elmo and started begging for a DVD to be turned on in the car and then thing two joined into the chorus of pleas. She was yelling Elmo and he was yelling Elma. Instead of being happy that Thing One had Thing Two on her side she became upset that he was calling her man, Elma! Thing One: "Ethan, he not Elma, his name is Elmo!" Thing One was not happy at all about any of this, no matter what Thing Two thought. As the song ends... Potato, Potahto, Tomato, Tomahto...Let's call the whole thing off!! What Candy Heart Are You? Which Candy Heart Are You? When you reach into the candy heart bag, there's no doubt you're coming up with a fire red heart that reads "Hot Stuff." It's not so much a label as it's your style — turning heads, getting numbers and raising room temperatures a few degrees when you walk through the door. You'd love someone who could match your flame-throwing ways, but so far, everyone just melts like wax when you turn on the heat. Got a romantic fireside dinner planned for you and your very own hottie? Better keep a hose nearby because sparks could start flying. And if you're still on the prowl, waiting to find someone who can hold their own against your undeniable sense of romance and action, keep a close watch. They're sure to come around soon when they see your "Hot Stuff" coming their way. This morning the mission was to get an updated picture from each member of the dynamic duo. Again it was easier said than done. We got started bright and early again and when Justin heard the goings on you could almost see the dust in his wake as the door closed behind him. As you can see we had a couple of location changes for both as well as clothing changes for Ethan. They both flashed their best fake smiles and Ethan decided to start batting his lush eyelashes for the camera. All of this silliness at 7:30 am again. I must be a total glutton for punishment but honestly I work really well under pressure as today was the deadline. Somehow I got a natural half smile out of Katie and I actually got Ethan to laugh and smile finally by dumping a bowl of play alphabet letters on my own head. Hey, I took one for the team. Since we have been home I have not taken even one picture of our whole family together. When we have all been together I simply have not thought about taking one. About 2 weeks ago I found two reasons why I needed to take one ASAP! Reason 1 - Katie's preschool asked us for one so that they can post it on the door of the classroom for the children to see. Reason 2 - We are attending our agency CNY celebration in Tampa and they show a slide show during lunch of the children then(at referral) and now along with a family picture. OK, now I have a mission - I must get a picture and I need it NOW! Mom and Dad (That is me and Marc) are either shuttling Ethan to a therapy or music class or taking Katie to school as well as juggling work schedules with each other and assorted other errands or duties that have to be done - our schedule is truly ridiculous right now! Ethan and Katie - They are either at one of the above activities or playgroup and if they are at home they never seem to be dressed for a picture or clean enough for one. Justin - He is always at school and if he comes home before the kiddos go to bed then they are usually covered in food at dinner or in the bath or in their PJ's. OK, I know it sounds truly ludicrous but that is really how life is right now. So at 7:00 this morning as I was in the shower I remembered that I HAD to get that picture and I needed it by Friday which is the deadline for the CNY event. I knew that Marc would not be home for the rest of the week at the same time as Justin would be home....I got out of the shower and Marc had already gotten the kiddos up and had begun dressing them. I told him to jump in the shower while I finished dressing them as we were going to take this picture NOW before Justin left for school at 7:45 am. Are we gonna pull out the tripod or wing it with something else? Where the hell is the camera??? Marc: "Lori, are you ready?" As I am throwing on a shirt and brushing my hair at the same time!! Justin: "What?!! We are gonna take a picture now?!?" Lori: "Yes, we are; come sit down and take off that grungy sweat jacket!" Oh believe me Justin looked thrilled with that statement, took off his sweat jacket and threw it behind him dramatically to make his point. Of course you know I loved that...sheesh!! Marc: "How do you set this timer again?" as he is squinting because he does not have his reading glasses on. Tick Tick Tick, that is the minutes ticking away before Justin tells me to forget it and leaves for school. 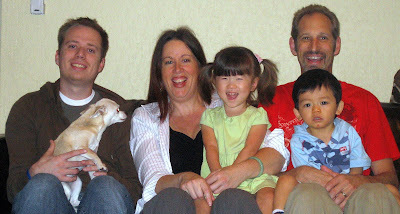 Somehow Marc figures it out and then we sit trying to make the kids smile and laugh while the timer is blinking in front of us and we are all trying to look happy for the picture. I think the kids really were happy, Marc and I were both pulling it off if I do say so myself but Justin was not quite there. Here is the final result of that mess. What do you think besides the fact that we should have our heads examined? Which one is the winner? Please, please, please if you have any mercy please pick a winner and not a do over. Take Three (Justin looks thrilled doesn't he? Lori seems to be praying here and where is the rest of the family? Tonight was VERY interesting to say the least as I did a huge amount of finagling (is that a word?) to make sure that my old blog address redirected to my new one with the archives intact. I was able to redirect on my own but without my posts. A huge thank you to my Blogistan buddy, Mary-Mia for giving me an easy; albeit scary way to execute it..whew!!! Another huge thanks goes to ~V~ the Blog fairy for all of her creative input and hard work on my blog redesign. Please visit her blog if you are looking for a face lift. She is so wonderful to work with and more than reasonable. I love my new look. So what do you all think? 3. In their post about the award they need to link back to the original entry. 4. Awarded parties must post the award banner on their site. 5.The banner must remain linked to Eric Novak's site. 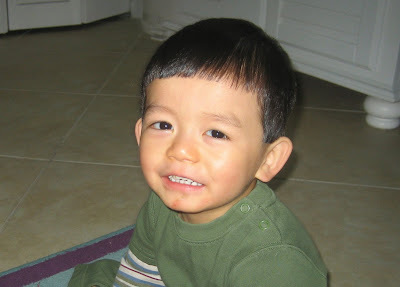 We5Chois is a new blog that is authored by another one of my friends here in South Florida. Kim is another Brit who's humor and slant on things always has me rolling. Even though she is new to the world of blogging, Kim is a fantastic China adoption advocate and has a tremendous wealth of information to share. She is the mother of three children 6 years and under so you know that she has a lot to say and will make you think as well as entertain you saying it. Cami Mei comes home is also nominated. Sherri's daughter Cami's comes from the same orphanage that Ethan does and her mom and I have forged a wonderful friendship. She and I totally get each other. We even share the same birthday although she is one year older than I am; sorry Sherri!! ROFL. Cami is Sherri's fourth child and this "earth mother", through her blog, can teach us all a thing or two about the power of loving nurture. Sherri can also see the true details in life's routine moments that many of us do not see. I have learned to stop and seek these details and nuances out because of Sherri. Our journey of love is last but not least. 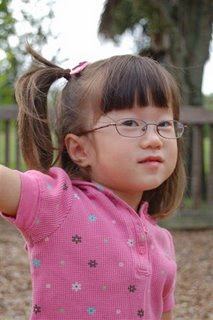 I nominate Barb's blog because it documents the true love that she and Mike have for their Beautiful Mia but also because Barbara is the person that brought China adoption into our lives. It is a long story and really much to personal to put out here but she is the reason that we were led to our youngest two children and there is no purpose greater than that. Huge hugs to you Barb, Mike and Mia! I will leave you with this image - It seems that the gruesome twosome (you notice that I did not say dynamic duo, so you can see where I am going with this) have kicked it up a notch in the "let's get into mischief category". Today it seemed that every time we turned our back they were getting into something that they should not. They truly have become co-conspirators and the lead hooligan happens to be Mr. E.
Check out this pic of our bookcase in the playroom. We found this scene after Katie told us that her "bookcase was messy". We kinda ignored this statement as we thought that she meant the usual mess of books put in haphazardly but she kept insisting it was "really messy" We walked in and found in addition to the mess that E was climbing the bookcase...sheesh!! This week has been a good one for our family. Justin is back in the thick of things in law school and enjoying it. 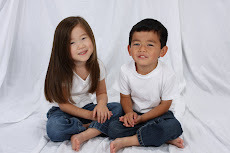 Katie is loving "big girl school" and we are having lots of fun and great one on one time with Ethan. Ethan has four therapy sessions a week and we are beginning to see the fruits of that labor. He is getting stronger, eating more and starting to talk a little bit. We have even had some success in the beginning stages of potty training with him. Of course, Katie tells us that she is "too little" to go on the potty. Somehow even though she knows that Ethan is younger and he is going on the potty somehow, some way, she is still too little (grin). We are getting into a good groove with the dynamic duo. Sometimes it is stressful when one of us takes them somewhere that they would prefer not being, like the doctors office. Yesterday, Marc took Katie for a follow up on her ear infection from last month and had to wait quite a long time for the doctor to get to him. When I called him an hour after the appointment, fully expecting him to tell me that he was done and that all was fine, I heard the sound of a VERY stressed daddy who informed me that if one of the children needs to go to the doctor we need to schedule it so that the other parent is with the other child!! Evidently, the two 2 year olds were a little out of control and Marc was having a Calgon moment. At the end of the appointment he was talking to the Doctor about a fundraiser that our FCC Group is doing (she treats many of our members) and would she like to be a sponsor? As they were discussing the details the kiddos were discussing a quick get away. When Marc looked down they had made there way out to the waiting room and if left to their own devises probably would have driven home. It sure would have been nice if they had paid before they left..LOL. Finally, I will leave you with a funny anecdote from yesterday and a few pictures from the last couple of days. Yesterday, Marc took Ethan to a music class and on my way home from work we met up on his way to the class and I took Katie home. We were having a lovely time together (just us girls:) and as the time approached for Marc to get home I preheated the oven for dinner. When the signal went off that the oven was preheated Katie yelled out "I'll get it!!" I asked her what she was going to get and she yelled out "the telephone!" Do you think that means that my oven does not get used very often? Ethan likes to not only put his shoes on but also Katie's as well. Do you think she got any spaghetti in her mouth? Katie dropped water from her cup all over her shirt so I took it off and she started running around the patio like a crazy woman!